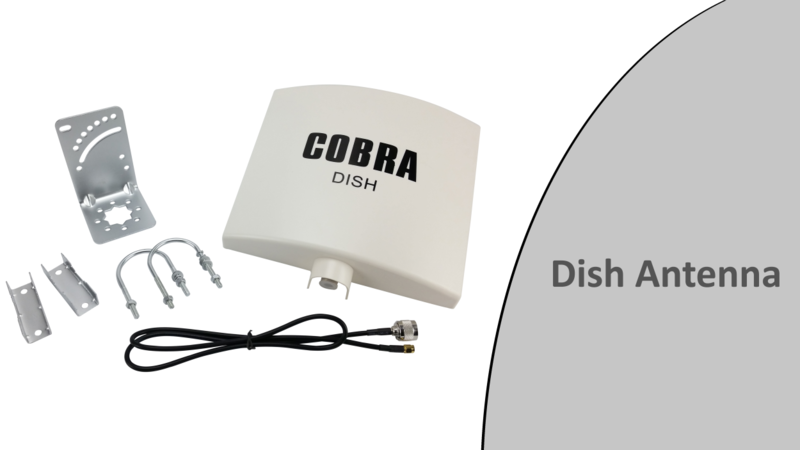 The COBRA Dish Antenna is a 120 degree unidirectional antenna for improving signal strength in one direction. The dish replaces the standard antenna on the 18R or 18R2, and provides a +8 dBm gain. This translates to an additional 300 - 600 ft. (100 to 200m). Although your range is increased, the dish antenna is also helpful for close range situations where you don't have direct line-of-sight, or you don't wish to raise your modules or antennas. You can also use the dish antenna directly on your 18M module for situations where a single module may be a significant distance away. For example, you may use the standard antenna on the 18R or 18R2, and then use a dish antenna on the 18M pointing in the direction of the shooter. This allows the standard 18R or 18R2 antenna (360 degree) to broadcast signal in all directions. Then, the 18M uses the dish antenna to point directly to the shooter and improve the quality of communications for that 18M only. For any questions about signal strength or how to solve a difficult signal situation, please contact Scott Smith at 518-222-7410 or ssmith@cobrafiringsystems.com. We are happy to create a solution for even the most challenging signal situations. An instructional video demonstration on the COBRA signal strength accessories.